There was never a question where Stacy and Matt wanted to have their wedding ceremony. Both agreed soon after Matt asked her to marry him (on bended knee, no less) that they wanted it to be at the home of Stacy’s mother on the Sea of Cortez in San Carlos, Sonora Mexico. The simple, yet breathtaking setting of palm trees, tropical bougainvillea, blue, blue water (including the sound of the surf and gentle breezes) created the backdrop for the simple but elegant wedding. But what really counted was the focus on the details’ aesthetics. The bride makes an entrance through hand-carved, Mexican doors carrying a bouquet of gardenias tied with a white satin ribbon to compliment her pearl-studded wedding gown. A “bouquet" of sea shells adorned her flip-flops. Her white beaded purse was borrowed and her “blue” was a white lace and blue garter. The groom and groomsmen wore khaki shorts, untucked shirts and flip-flops. 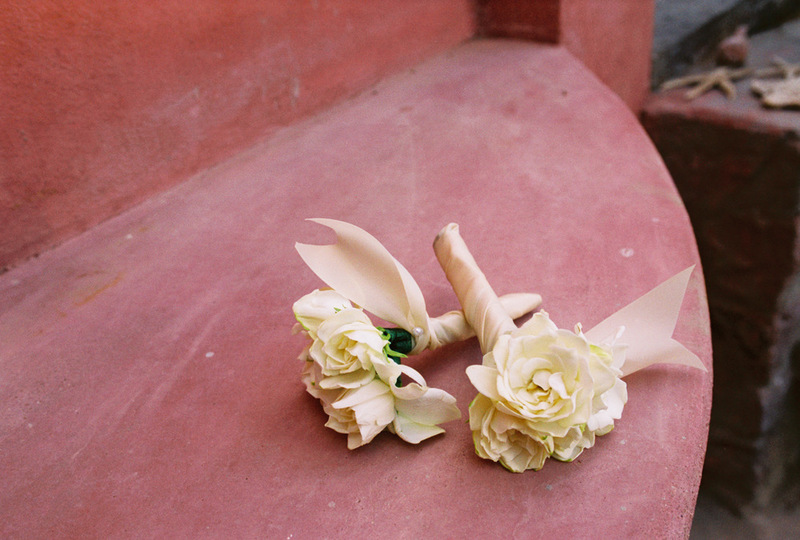 Several tightly wrapped gardenias were wrapped in satin ribbon for the boutonnieres. White clusters of sea-shells framed the “Stacy & Matt” emblem that was hung on the cobalt-painted front door to greet guests. The wedding programs were designed and printed by Stacy and given a “real” shell (found on the beach by her Mother’s home) adornment. Several tables were set in the entry courtyard along with other table on the seaside patio to accommodate over 100 guests. The tablecloths were a natural linen with a white painted border. 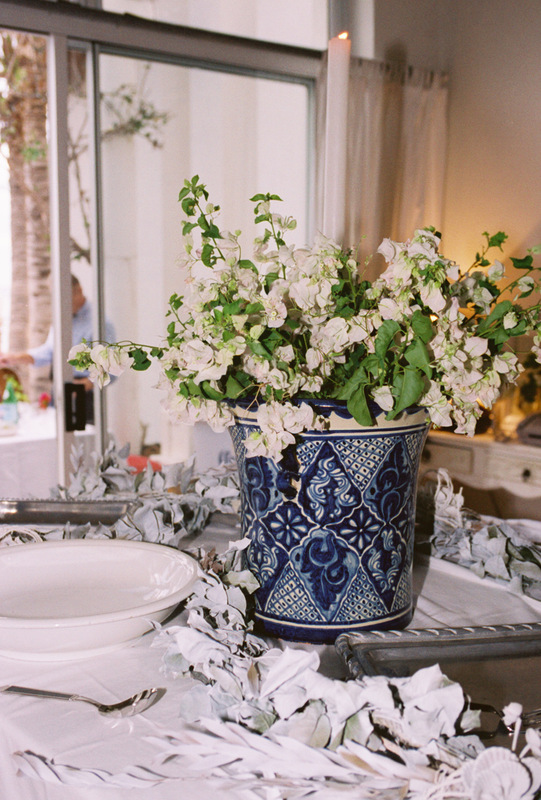 Urns of blue and white Talavera, filled with white bougainvillea among sprays of sea shells (sprayed with flat white paint) ladened the buffet table draped with white tablecloths. 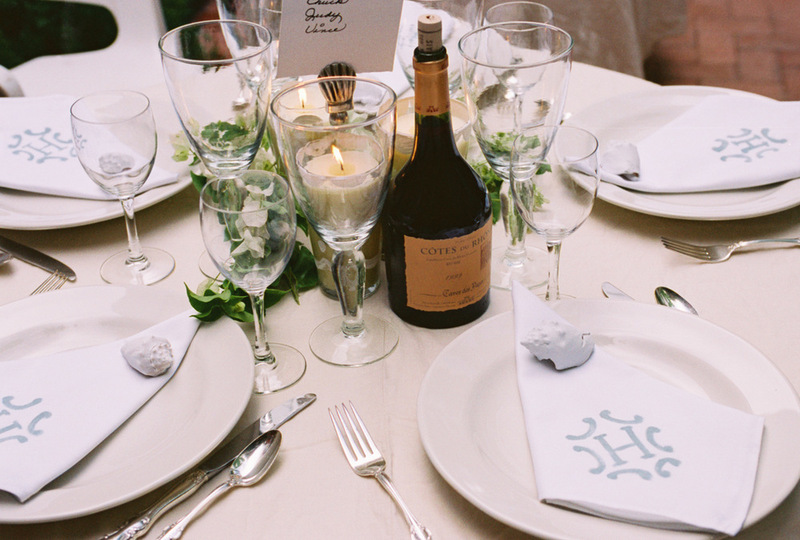 The simple but elegant table-setting featured a light blue-grey “H” monogrammed napkin. The napkins were hand-painted with latex house-paint and were a gift for the bride to keep for her own dinner parties. (The plates, as well, were not rented but purchased for the bride to keep). A single sea shell was simply placed on each napkin. Each guest received a special wedding favor at their place setting of Sal del Mar, a gourmet sea salt. The wedding favor was a hand-embroidered bag custom-designed for the occasion with a heart and laurel wreath. The tag was written as a thank you from the bride and groom. The wedding cake was not left out of the sea shell adornments decoration details. The cake was made by a local woman decorated with white on white frosting. A sea shell spray of flowers created by by an artist and friend topped the tiered cake. A wreath of white bougainvillea circled the cake and glass votives hand-painted with a white scolloped edge created a soft glow to the table-settings.